Find hotel near Cabo Rojo National Wildli .. The Cabo Rojo Salt Flats & Wildlife Refuge are maintained over 1800 acres by the US Fish & Wildlife Service. The Salt Flats, which are a marvel of nature, are contained inside the larger Wildlife Refuge. While the Salt Flats are famous for being a natural anomaly, the wildlife refuge houses plenty of flora and fauna, especially for bird watching. Together, they form one of the most special attractions of Cabo Rojo. The trails inside the wildlife refuge range from about 1 to 2 miles in length. There is an interpretive centre in the refuge, where you can learn about the wildlife of the area. For a fee, you can even have an interpretive guide take you on a tour. The refuge has a plethora of ecosystems- dry forests, lagoons, mangroves and even coral reefs. 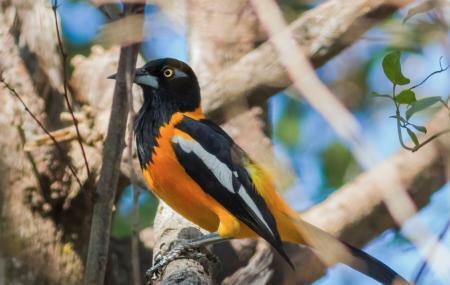 Not only is it a great place to go bird watching and appreciate the different types of plants, but you get to also see the different types of animals that call it home. The salt flats were added in 1999 to conserve and protect the single most important point of convergence for migratory shorebirds in Puerto Rico. They are considered unique & irreplaceable. There is also a beautiful butterfly trail inside the wildlife refuge. The salt from the Salt Flats have a number of applications. It is generally used for non-food purposes, like swimming pools, ice melting and soil amendments. The Cabo Rojo Wildlife Refuge and Salt Flats are not just a wonderful natural attraction, but they are also of massive ecological importance to the area. After you are done with the salt flats and the wildlife refuge, you might want to visit the Cabo Rojo Lighthouse or La Playuela Beach, which are both just a little farther down Road 301. How popular is Cabo Rojo National Wildlife Refuge And Salt Flats? People normally club together Parguera Trailer Camp and Playa Sucia while planning their visit to Cabo Rojo National Wildlife Refuge And Salt Flats. Great place to see sunset. Drive is a bit bumping as you get closer, but very well worth it. Hike up is easy and short, rocks and ocean views are highly recommended. Interesting place to visit and learn about the natural salt making process. The light house was a museum with the history of the whole place. They allow you to walk up to the roof but not the light. The view of the ocean is gorgeous and the breeze you'll feel is refreshing. Then, once you've walked up to the cliffs the experience becomes one of a kind. The cliff side is covered in salt from long ago which gives the rocks a special color like pink and makes the slippery but up to the cliff this is not the case. The rocks have their instinctive color and texture which makes it look iconic. It is dangerous so I would advise against standing too close to the edge but if you stand in just the right place at just the right time, when the wind is not as strong and the waves look calm, the best picture you've ever taken will be upon you. I can say from personal experience that the sight from the cliff is beautiful and worth visiting. More so with the family. Then after the trip, you can go to the beach with your family and have a great time. This should be in everyone's itinerary when they visit Puerto Rico. It is nature at its finest with a natural ecosystem worth exploring. Keep the area clean and be mindful about the wildlife while exploring. Bring water and a bathing suit for the beach, its going to be HOT!